Earlier this week, Canadian Pacific (CP) unveiled the next generation of grain transportation at the G3 Pasqua elevator near Moose Jaw (Saskatchewan). The 8500 ft high efficiency product (HEP) train features new, and highly efficient, Canadian-made hopper cars, and can move approximately 44% more grain than the prior generation of grain train. 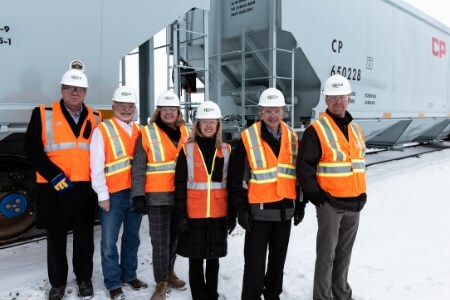 "A state-of-the-art loop track terminal like this is the perfect backdrop for launching our first HEP train and bringing in a new, more efficient era of moving Canada's grain to market," said Joan Hardy, CP's Vice-President Sales and Marketing – Grain and Fertilizers. "As CP continues to take delivery of new railcars, and elevator operators expand their facilities to handle 8500 ft trains, this HEP train will become the new gold standard – driving further efficiencies for farmers, shippers and the entire grain supply chain." G3 constructed its state-of-the-art Pasqua terminal loop track to handle the 8500 ft long HEP trains. The fast loading loop track means CP can keep locomotives attached to the train during loading, and those same locomotives are in place to launch the train once loading is complete. The new hopper cars that make up today's train feature a capacity 10% greater by weight than the older-model Government of Canada cars, and 15% more volume. The cars carry this extra product on a frame 5% shorter than the older cars, meaning more cars can fit into a train of the same length. The cars are part of a half-billion-dollar investment CP is making to upgrade its fleet to better and more efficiently serve farmers and the Canadian economy. By the end of this year, CP will have approximately 500 new hopper cars in service, and that number will grow to 1000 by spring 2019. Over the next four years, CP plans to purchase a total of 5900 new hopper cars. CP moved 2.64 million t of Canadian grain and grain products in October making it CP's biggest month ever for moving Canadian grain, breaking the record from September 2017. CP also announced that it has broken its previous record for carloads of Western Canadian grain and grain products shipped to the Port of Vancouver in a single month. "The future of the grain supply chain is bright," said Hardy. "With continued collaboration, a commitment to innovation, and strategic capital investment in key markets, like Saskatchewan, the grain supply chain is well positioned for continued success."